It’s sequential art. Even singular pieces are narrative-based. Do you create your illustrations on paper or on a screen? Tell us about your process. Everything is digital. I moved around a lot after graduating from UTC and had been drawing with a tablet since I was in middle school, so it was easy to ditch the real media and jump to all digital for convenience. I had been doing both for a long time, but treated my digital stuff as a dirty art secret that I did for fun. Then I realized (with some help) that just because it was fun and didn’t have any deep conceptual meaning, it was still art. You have a collaborative partner for some of your work. Could you describe that relationship a bit, including how you share ideas and make creative decisions? Ali Burke is the person I spent a decade - from high school through college - trying to find. I wanted a writer who understood all of the things that I didn’t to create a deep narrative for my art. Something bigger than just me. A whole world! We spent a lot of time at the Yellow Deli building the story with notebooks and Google Docs, but then she moved to Boston and now we collaborate via Slack and Google Docs. I send CRAZY SPECIFIC ideas for ARRO (our main project). And she adds her ideas and blends them beautifully. I can’t recall arguing over specific things. Neither of us thinks our ideas are sacred, and we talk it out. Something we started recently was an annual retreat for a weekend to work on the story without distractions. I think sequestering ourselves away really helps make sure we’re both on the same page. Please describe ARRO, your ongoing comic book series. ARRO takes place three years after most of North America was wiped out by a gene-altering disease in the drinking water. The story follows a team hired by the American Research and Recovery Organization to travel across the southeastern United States and scout what's left of the former new world. Zombies have played a significant role in pop culture for the last several years. What inspired you to work along those themes? Not so much zombies - that was the idea I had in high school. 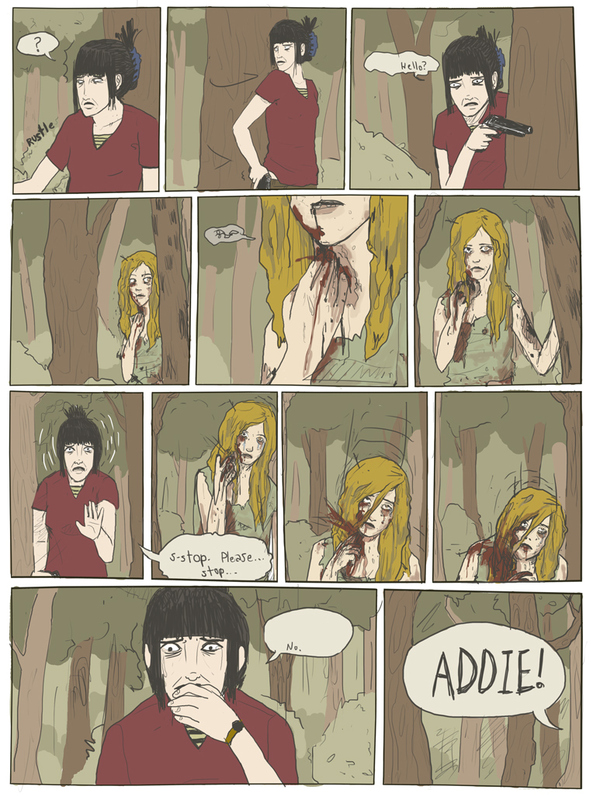 The first thing Ali said when we started this project is that we are NOT doing a zombie story. We had to figure out how to make something semi-apocalyptic without rehashing the same tropes as everything else out there. So we made a world where all of the unaffected countries are trying to rebuild an area that was completely wiped off the map (North America) and to start using the valuable resources there while also figuring out how to navigate this now unfamiliar landscape and deal with the inhabitants that were left behind. Then we focused on one sliver of the story and one group’s journey through the chaos. We just wanted to tell a story that fit my aesthetics and felt true to both our voices and now -more than in 2009 when we started working on it – our current sociological landscape. Personal experience. Everything. Nothing. Somewhere in-between? Probably just a bunch of bands I listened to in college. Mainly Canadian ones. Where do you see the intersection between art and pop culture? Both are commodities, but one is more accessible. What would you like viewers to get from your work? A good story, I hope. I can’t recall my “hire-date”, but I graduated in 2009, so let’s put it there. I try to keep it as simple and streamlined as possible. Everything is drawn in Photoshop, mostly with three brushes. I have found a person who understands my abilities and I have a blast working with her. Before finding a writer to collaborate with my work was mainly just illustration-based, and I was pretty stifled. I knew I wanted to work in this medium but I wasn’t confident in my story-telling abilities. I’ve grown there too and made a few comics on my own, but I prefer collaboration. I like where I am.